Speed 10 ft., fly 50 ft.
Mimicry. 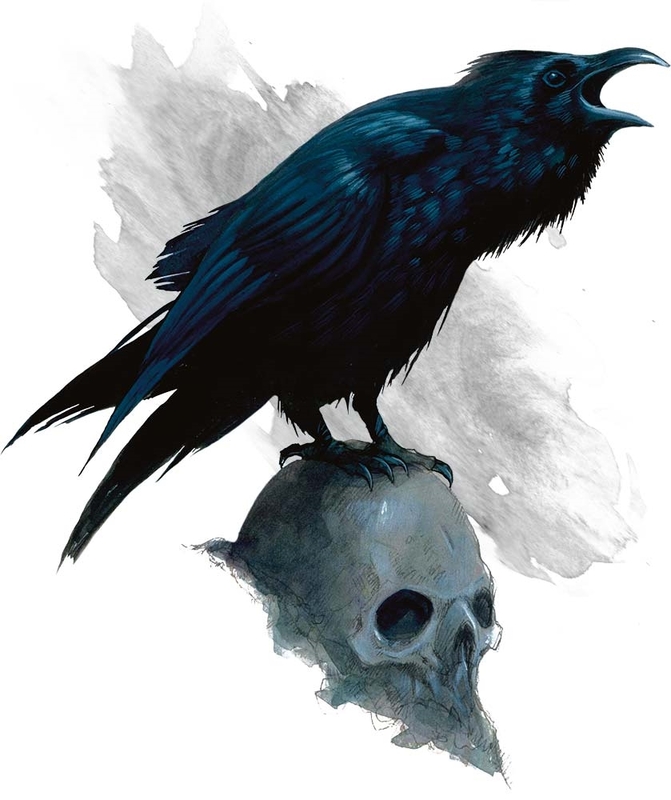 The raven can mimic simple sounds it has heard, such as a person whispering, a baby crying, or an animal chittering. A creature that hears the sounds can tell they are imitations with a successful DC 10 Wisdom (Insight) check. Beak. Melee Weapon Attack: +4 to hit, reach 5 ft., one target. Hit: 1 piercing damage. Given that a raven does 1 point of damage when including its -4 strength adjustment, does this mean that the beak attack actually does 5 points of damage? No, it is 1 + Str mod, as normal. However, the rules say that an attack deals never less than 1 damage on a hit. Although it is a bit weird, the attack seems to assume it is a dex based attack, which would mean it should do 3 damage... But then again, the monster stat blocks in 5e are full of weird inconsistencies. Quite frankly... ravens shouldn't have a lower intelligence score than a housecat. They should probably be a little closer to the baboon or ape in intelligence. Ravens are known to be extremely intelligent birds in real life, after all! What if you want your character to be a raven, how do you set the stats?